Britannica Original Sources gives adult learners and students access to an extensive, continuously increasing collection of over 420,000 e-works of classic, primary source, and general reference materials that have been collated into subject areas. Ideal for expanding library collections, engage your users with this vast collection of original sources and personal accounts of humankind’s social, political, legal and religious development. Contributions including from Sun Tzu, Sigmund Freud, Charlotte Bronte and James Joyce, this authoritative resource brings subjects to life and provides the curious minded with direct access to first-hand accounts from those at the centre of events. 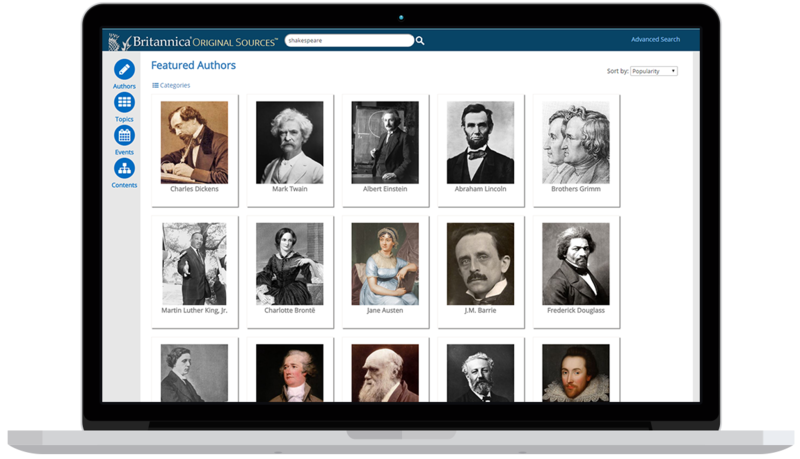 Britannica Original Sources is a reliable fact-checking reference of history-makers’ greatest accomplishments - from the dawn of civilization to the present day.